Miami Herald writer Andres Viglucci provides a comprehensive account of The Underline’s progress, people and plan leading up to the groundbreaking of Phase 1: Brickell Backyard on Thursday, November 1st. It took 20 years for Meg Daly’s late father, the prominent attorney Parker Thomson, to realize his ambition of a transformative performing arts center in Miami. It may not take Daly and her ad-hoc team of volunteers, dreamers and entrepreneurs quite that long to pull off her own unlikely conceit: a 10-mile-long park and walking and cycling trail that aims to regenerate an overlooked swath of Miami in the same way the heralded High Line did along lower Manhattan. But she’s having to tap into every bit of that reserve of Thomson family grit to get it done. 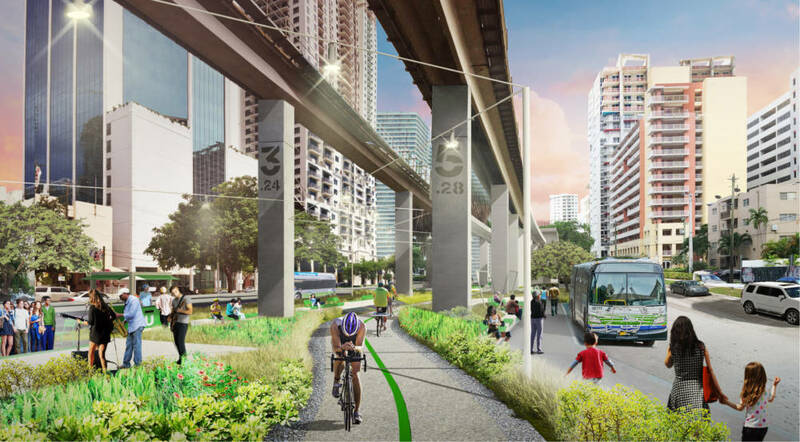 On Thursday, a contractor is scheduled to break ground on the first phase of the much-anticipated Underline, which will eventually extend from downtown Miami to Dadeland under the Metrorail’s elevated tracks. That initial segment, in the booming Brickell district, is just seven blocks and a half-mile long. But moving from conception to construction in five years is a flash for a civic project in Miami. At least two more segments, one along Miami’s The Roads section and another in Coral Gables, will follow in short order. And no matter what it takes, Daly says, she is determined to see the Underline all the way through to completion in the same unflagging spirit her father instilled in her. Thomson, who died suddenly last year at 85, not only helped usher the Arsht Center for the Performing Arts into existence, but also was Daly’s earliest champion when she was struck by the inspiration for the Underline, an idea she at first feared might be a non-starter. Read the rest of this comprehensive coverage here.